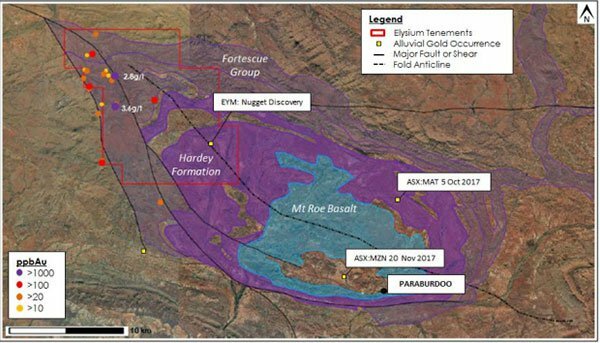 Elysium Resources (ASX:EYM) has provided a promising update from its Bellary Project, 30km north-west of Paraburdoo in Western Australia. 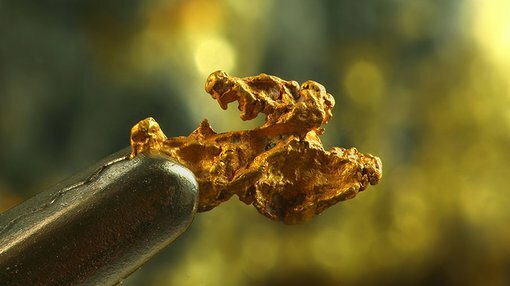 The company has indicated that gold nuggets (six) have been discovered in Hardey Formation basalt conglomerate via metal detecting over a 50m strike region. 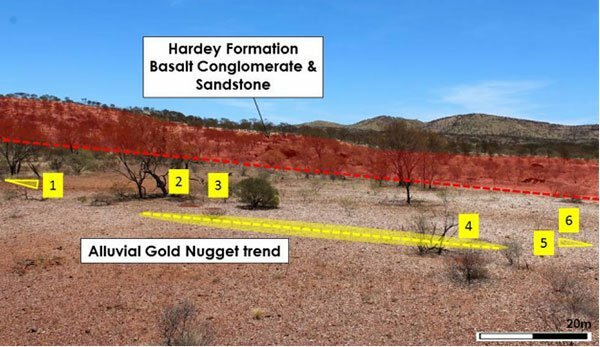 In addition, the flat-pitted watermelon seed and coarse gold nuggets spatially correlate to one of the five radiometric anomalies identified within the Lower Fortescue Group to the north (below). The company also indicated that three outcropping parallel quartz veins have been mapped within close proximity of the discovery, with initial assay results from rock chip sampling at this location returning anomalous results of 3.89% Copper and 0.9g/t Gold. Elysium believes the presence of basalt conglomerate units and exceptional quartz veining at the site leaves its Bellary Project as a potential candidate for Witwatersrand paleo-placer style and higher grade orogenic style mineralisation. However, it is early stage here and investors should seek professional financial advice if considering this stock for their portfolio. The company’s geological team is now in the final stages of its Phase 1 field programme, with results expected in the coming weeks.